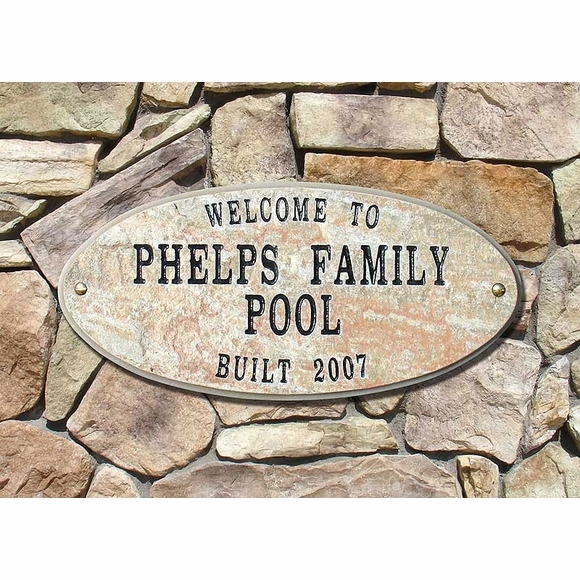 Home > Custom Signs > House Established Wall Plaques & Circa Signs > Custom 4 Line Granite Plaque For Welcome, Pool, Home or Business Name, Built or Est., Family Name, etc. Personalized 4 Line Plaque - - solid granite custom sign holds up to four lines of personalized text. Solid granite with natural stone texture. Custom made signage with the shape and color you select. Personalized text can say anything, for example, address; family name; welcome to our spa, pool, home, campus, etc. ; home or business name; historic information; property information; established date or built date; and general directions. Features deeply engraved numbers and letters. Maximum character count on each line is 16 (including spaces and punctuation). Please type your text exactly as you want it to appear. You can use both upper case and lower case, as shown in the rectangle example. If you are not using all four lines, please leave the input box for any unused line empty. Shapes: oval and cut-corner rectangle. Plaque color: autumn leaf natural, polished black, and quartzite. Autumn leaf and quartzite plaques come with black lettering; polished black comes with gold lettering. Personalized solid granite sign with 4 lines for your address, welcome message, property information, or anything you want to say.